It’s The Zip Code, Stupid! That was the sobering message delivered by AETNA CEO Mark Bertolini during an interview on CBS this morning. And he’s right. A May 2017 study from JAMA Internal Medicine concluded that geography is the biggest X-Factor in today’s American Hellzapoppin version of health care. The study analyzed every US county using data from deidentified death records from the National Center for Health Statistics (NCHS), and population counts from the US Census Bureau, NCHS, and the Human Mortality Databas and found striking differences in life expectancy. The gap between counties from lowest to highest life expectancy at birth was 20.1 years. On the whole, though, US life expectancy at birth increased by 5.3 years for both men and women — from 73.8 years to 79.1 years — between 1980 and 2014. But the county-by-county magnitude of the increase was determined by where one lives. That is, wealthy counties showed significantly greater increases in life expectancy than poor counties. What is even more alarming is that some counties have experienced declines in life expectancy since 1980. The population has increased by 40 percent, but hospitalizations have decreased by more than 10 percent. There is now a lower rate of hospitalizations than in 1946. As a result, the number of hospitals has declined to 5,534 this year from 6,933 in 1981. People are apparently trying their mightiest to get health care anywhere except a hospital. According to Ezekiel, hospitals now seem less therapeutic; more life-threatening. Also, and this is where CVS is heading, complex care can now be provided somewhere else. Another red flag from Mark Bertolini’s CBS interview was his reference to life expectancy dropping two years in a row. He’s right about that, too. In 2015 and 2016, life expectancy declined by a statistically significant 0.2 and 0.1 years, respectively.¹ Until now, life expectancy in America hadn’t declined since 1993. The men and women of Humphries County deserve nothing less. ¹ 2015’s drop was originally put at 0.1 year by the CDC, but was revised to 0.2 years after Medicare data were re-evaluated. 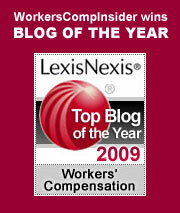 Posted in health care, Research | Comments Off on It’s The Zip Code, Stupid! 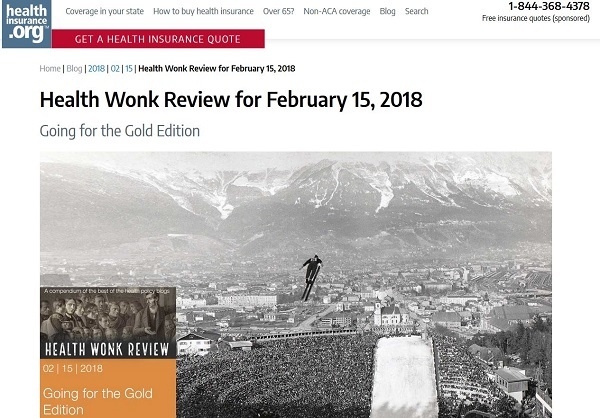 Steve Anderson has posted the Health Wonk Review for February 15, 2018: Going for the Gold Edition at HealthInsurance.org blog. It’s an entertaining and wide-ranging smorgasbord of health policy topics of the day. A recap of Health Action 2018, Families USA’s annual meet for healthcare activists. If you aren’t familiar with healthinsurance.org, you should be. Check out the impressive roster of contributing authors and the excellent state health guides. And just a heads up: In 2018, Health Wonks are on a once-per month schedule so catch this issue – you won’t have a chance for more wonkery until March. Posted in health care | Comments Off on Who’d A Thunk It? Something Good Out Of DC!